Why, one of the most venomous creatures in all the world, of course! 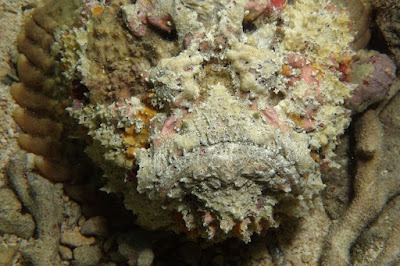 You see, the thing about Stonefish is they belong to that most illustrious and bizarre of fishy orders known as Scorpaeniformes, the Scorpionfish. Venomous spines are commonplace among the Scorpionfish (they're sort of named after it), but none are quite so excruciatingly and victoriously venomous as those of the one that got named after a stone. 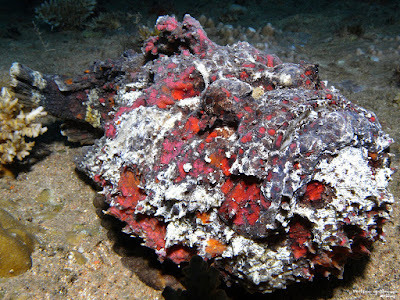 The other thing about Stonefish is there isn't just one of them. There are five species, all belonging to the genus Synanceia. Apparently this name means "with pot" or "with receptacle", where the receptacles in question happen to be full of VENOM! 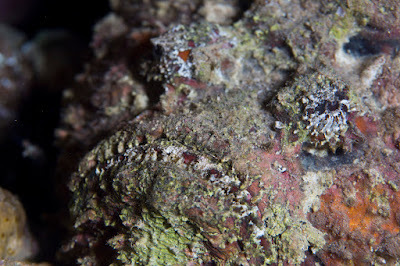 They lie at the base of sharp spines along the Stonefish's back, exactly where they need to be to slide effortlessly into soft, unsuspecting feet. Worse still, the spines are sharp and strong enough to get through the soles of shoes if they're soft enough! This is all most unfortunate. Not many people wade into tropical seas wearing sturdy Dr. Martens boots. Or heels or whatever. One must be wary and suspicious of stone-shaped objects in these waters. Stonefish can kill! The pain from a sting can be excruciating enough to cause hallucinations, entire limbs can swell up and then there's the nausea, fever, trouble breathing and possible death. 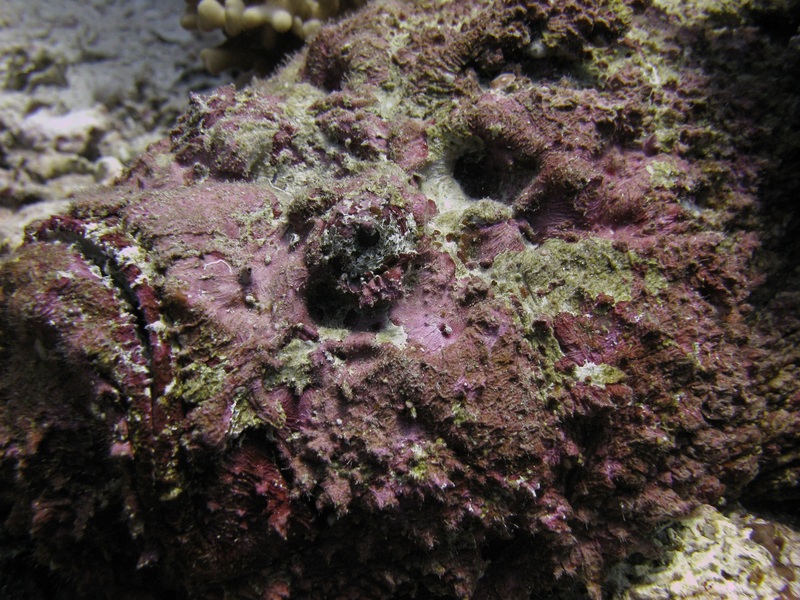 Thankfully, few people actually die from Stonefish stings. Hot water helps to break the venom down and antivenom is available. Also, it seems a sting in the foot is a lot less dangerous than a sting in the chest, near those juicy, life-sustaining lungs. This may be why stone-hugging never took off like tree-hugging did. 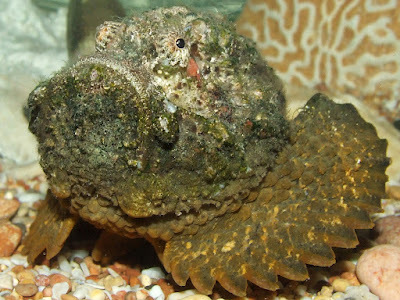 The first species of Stonefish to acquire a scientific name was the 60 cm (2 foot) long S. horrida, the Estuarine Stonefish, named by the original arch-namer Carl Linnaeus himself. "Horrida". Now there's a name! Not perhaps for a son or daughter. Not at first, anyway. It could be a nickname or something once they grow up a little and you realise how horrible they are. It's a Latin word that means all sorts of Sasquatch type things. Things like rough and bristly, rude and uncouth, and dreadful and horrid. That's not to say mean things about Sasquatch, Bigfoot or yetis. They'd get on great with my stone golem-fish. And besides, for all I know they're all clean-shaven, have the manners of a Victorian baroness and are perfectly loving and generous once you get to know them. Stonefish are just horrid, though. They may not be bristly or hairy - they don't even have scales - but that doesn't mean they have silky smooth skin. 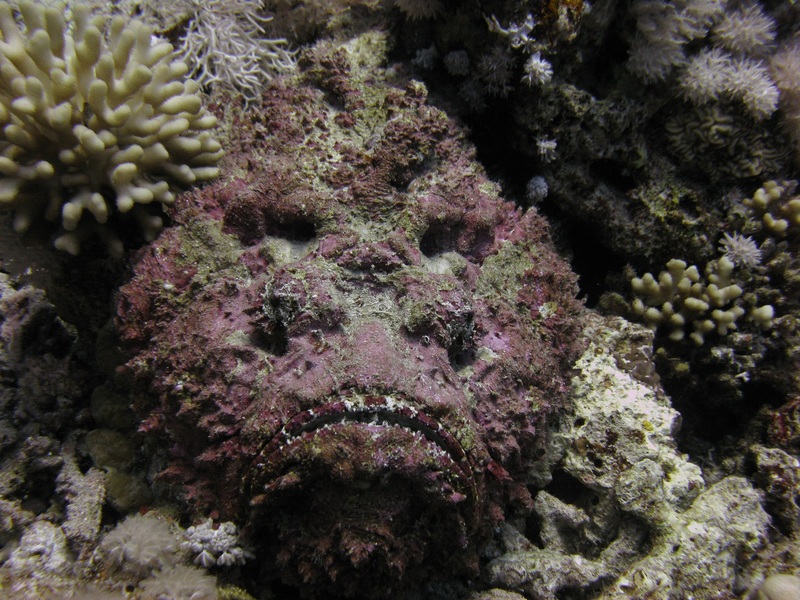 Instead, Stonefish are covered in all manner of warts and wrinkles and lumps and bumps. 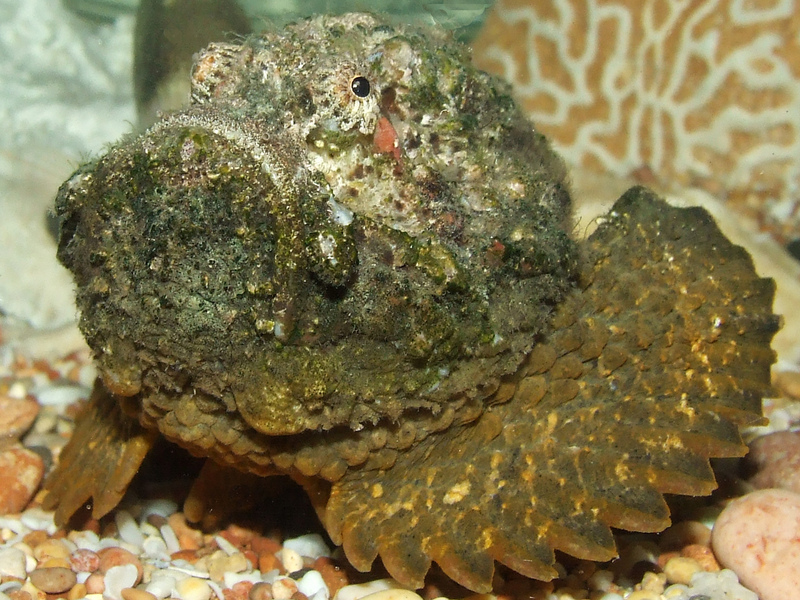 The world's most widespread Stonefish is even named after it. It's called S. verrucosa, which comes from the Latin for "wart". That particular Stonefish is found all over the Indo-Pacific, in warm, shallow waters from South Africa all the way around to Australia. This is unfortunate since the Stonefish's warty skin and mottled, stony colour provides them with excellent camouflage. Add a light covering of algae and assorted debris, plus the Stonefish penchant for not moving at all, and they look just like a stone! A very angry stone. Like many other Scorpionfish, Stonefish like to spend pretty much all their time resting, or should we say waiting, on the sea floor. Above their enormous pectoral fins (which they can use for walking... or more waddling) and their brawny head (which they use for scowling), their eyes bulge out to provide a good view of everything going on around them. When a tasty fish or crustacean wanders by, that fearsome frown opens up to envelop prey in less time than it takes to realise that stone you stepped on... wasn't really a stone. Whoa! I just got an idea. Catapults! 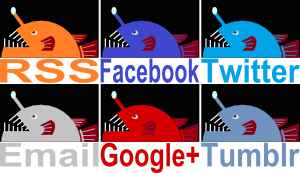 Stonefish-hurling catapults! My army is finally complete! I wonder what the Stonefish thinks of getting hurled through the air and crashing venomously in the midst of my enemies? Cool as a stone cucumber!